Various suspicious applications usually pretend that they act beneficially. MG Suggestor also does that in order to convince computer users that it is very beneficial and thus encourage them to download it. We do not recommend installing MG Suggestor on your system because this program is known to be an advertising-supported application (adware). This means that it will keep displaying advertisements on your screen. Such advertisements might be rather dangerous in the sense that they might redirect you to untrustworthy websites and cause harm to your PC. Therefore, you have to stop them from appearing as soon as possible. You can easily do that by removing the adware causing them to appear. If you want to find out how to remove MG Suggestor, you should read through this article. 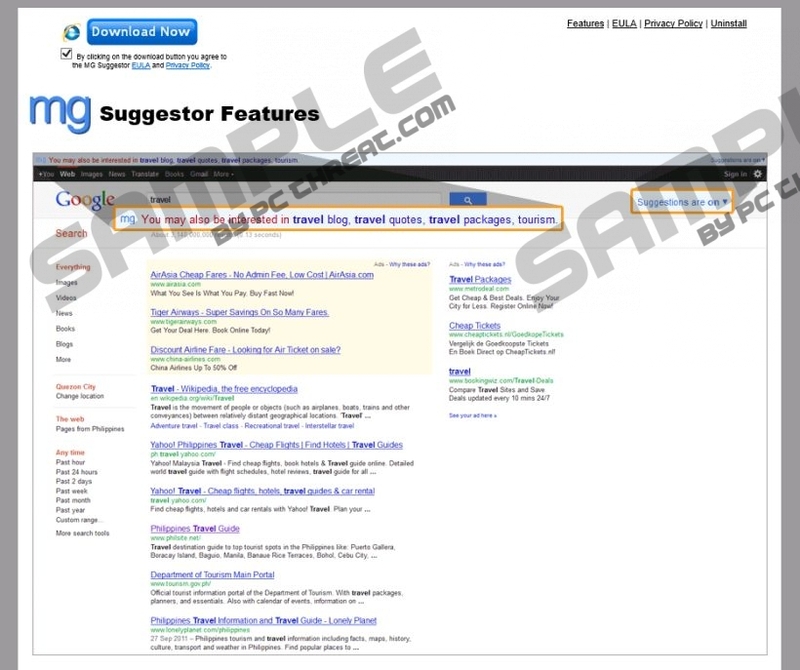 Many computer users think that MG Suggestor is a very useful program because it promises to suggest keywords for users in order to help them search the web faster. In addition, it claims that users will be able to watch YouTube videos without leaving the Google search engine. Even though it seems that MG Suggestor has many useful features, there are definitely more drawbacks associated with this program than there are benefits, so we do not think that you should keep it on your system. If you decide not to take any action, you should know that you will have to deal with various commercial ads. In addition, MG Suggestor will record information associated with your shopping and Internet browsing habits. Security specialists working at pcthreat.com think that MG Suggestor might have entered your system with other untrustworthy applications. You might not even know that they are present because they can act behind your back. Even though there are no other symptoms to indicate that other malicious applications are installed, you should still check your system’s condition. The easiest way to do that is to scan your system with a diagnostic scanner. If you do not want to allow malware to enter your system, you should install an antimalware tool on your system and keep it active. Remove MG Suggestor as soon as possible because it is an untrustworthy program and it might cause you different problems regarding your system’s security. You can remove this program via Control Panel; however, if you do not know how to do that, you should scan your system with SpyHunter or another trustworthy tool, and it will remove all the infections for you. As you have probably understood, it is worth investing in an automatic tool if you want it to remove ALL the existing threats for you. Right-click on MG Suggestor and click Uninstall. Quick & tested solution for MG Suggestor removal.